On a glorious day out in the Lake District there can be no better pastime than wandering through some of the finest examples of garden design in the country. With landscape architects the calibre of Thomas Mawson, Guillaume Beaumont and even William Wordsworth himself, you will find yourself spoilt for choice. Here are five that we think top the list. If you love topiary gardens, this is the place to visit. With over 100 pieces clipped in unusual designs, Levens Hall has the oldest and most extensive topiary garden in the world. The original designer was a Frenchman named Guillaume Beaumont and it was essentially a late-Renaissance (Baroque) parterre featuring mainly hedges and small topiary pieces. However, there is now so much more to see in the garden which retains many of the 17th century features whilst also embracing contemporary plantings. Early in the season, beneath the topiary and the orchard trees, tulips, daisies and pansies feature in abundance and vibrancy. In summer a further 20,000 home-grown season flowers burst forth in glorious, co-ordinated hues. From mid-summer the rose garden is a spectacle not to be missed. Thomas Mawson was a Lancashire lad who, from humble beginnings, went on to design some of the most important gardens and parks around the world. Some of his finest work is found in the Lake District where he was commissioned to lay out 20 major gardens in the Victorian and Edwardian era. Graythwaite was one of his first designs. Designed in the arts and crafts style, it remains true to Mawson’s vision - a mix of formal and informal areas across twelve acres. The formal gardens have yew hedges in good company with sundials and gates designed by local architect Dan Gibson, who also designed the house at Brockhole. The daffodil field has maple trees and an arborium which has been planted to commemorate family births and marriages. In spring the rhododendrons, azaleas and shrubs are described as a ‘riot of colour’. The magnificent Holehird Garden, another of Mawson’s commissions, fell into disrepair and neglect during WWII, but has been restored to its former glory under the expert hands of the Lakeland Horticultural Society and its volunteers. It is a seventeen-acre hillside garden – a beautiful spot for a picnic and walk around the grounds with views across Windermere. There are specimen trees and shrubs, a colourful walled garden, a lake, extensive rock and heather gardens, alpine houses and national collections of ferns, astilbe and hydrangeas. On Wednesday mornings, from Easter to October, at 11.00 a.m. there are guided walks through the gardens for small parties. Rydal Mount was Wordsworth’s home from 1813 until his death in 1850. He often said the grounds were his office and indeed, tucked away from the house and overlooking the two lakes Windermere and Rydal Water, he built his “writing hut” where he did much of his composition. The extended Wordsworth family were all a keen gardeners and they created a large lawn bordered with flowering shrubs to the west of the house with four terraces, including Dora’s Terrace, above the lawn. There are rare shrubs and, in season, the daffodils, bluebells and rhododendrons produce a spectacular display of colour. Dora's Terrace was named after Wordsworth's daughter, as was Dora's Field. This was purchased by Wordsworth when he fell out with his landlady, Lady Anne le Fleming of Rydal Hall. Wordsworth anticipated having to leave Rydal, so he bought land next to the house, intending to build his own house there. However, he patched up his differences and scrapped his building plans. He then gave the property to his daughter, Dora. When she died, he and his wife Mary, planted Dora's Field with daffodils as a sign of remembrance. 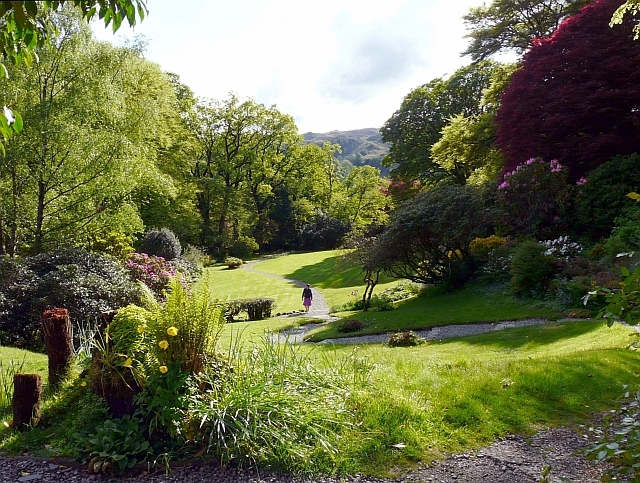 Just a stone’s throw from Wordsworth’s former abode are the grand 19th Century Rydal Hall gardens. The building itself is now a commercially run enterprise, but visitors are invited to stroll around the grounds. There are thirty-four acres including the elegant Thomas Mawson-designed formal Italianate gardens to the front of the Hall. The informal woodland has a sculpture path, ponds, a waterfall and a restored grade II listed ‘Grot’ – Britain’s first bespoke viewing point dating from 1689. An early 19th century woodland path leads to the Community Vegetable Garden set in the Old Walled Kitchen Garden. The orchard boasts 30 northern varieties of apple dating back to the 1850s and a plethora of flowers and vegetables growing alongside each other. English Afternoon Tea completes a day in these wonderful gardens. 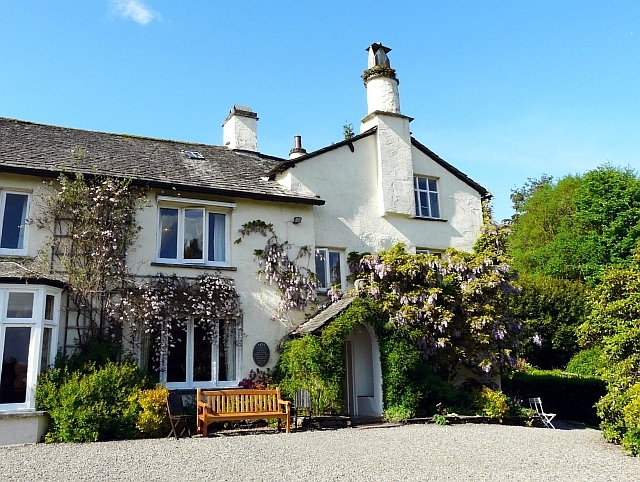 Low Wood Bay, with its view over Lake Windermere to the Lakeland fells, is in easy reach and serves several varieties of tea and a delicious selection of sandwiches and cakes served with style in the traditional manner. Champagne can be added for the perfect end to a day in an English country garden.